Forged Flanges, Forged Steel Flanges, Forged Flanges Manufacturers & Exporters, Forged Flanges Suppliers. We Royal Steel India, are one of the leading Manufacturers, Exporters & Suppliers of Forged Flanges. With firm commitment to quality, we are involved in manufacturing a flawless range of Forged Steel Flanges. 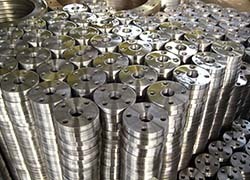 The offered forged steel flanges is known for its longer service life, to ensure the same, we manufacture these using optimum quality steel and other raw material, sourced from vendors of high repute.